Mock orange (Philadelphus Coronarius) is a deciduous shrub native to Southern Europe. It is in the family Hydrangaceae. 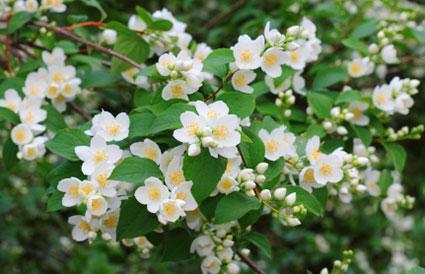 Mock orange is a popular ornamental shrub grown for its fragrant flowers and its heartiness. It can act as a hedge or privacy screen, add color to a flower bed, or be the center of attention. Mock orange shrubs grow up to 10 feet tall and eight feet wide. They have bowl-shaped, white flowers that are very fragrant and have a prominent stamen. The species as a whole has a profusion of flowers, but some cultivars have fewer blooms. Mock orange shrubs are not hard to grow. They will grow in containers or in the ground, and they are hardy to zones 4-7. Simply follow these steps to have fragrant, beautiful flowers each summer. Mock orange grows best in full sun but will tolerate partial sun. Find a sunny spot that is well-drained as mock orange does not do well with wet feet. Till the soil to a depth of six inches. Till in about three inches of compost. Now you are ready to plant your mock orange shrub. Most mock orange plants are sold as container-grown shrubs. This means you can plant the shrub any time of the year. However, winter is the best time to plant shrubs as they are dormant, and it is not as big a shock to them. Dig a hole that is big enough around and deep enough that the entire root ball can fit into it. Carefully lift the entire root ball out of the container, and place it in the ground. It should be planted at the same depth as it was in the container. Put the dirt you removed from the hole back in around the root ball. Do not add fertilizer or additional compost or other amendments to the soil, or the roots will grow in a circle in the hole and girdle the shrub. Water in the shrub well. Mock orange is easy to maintain. Water it with one inch of water a week for the first year after it is planted. After that , you will only need to water it when it has been very dry. Mock orange shrubs are healthier when pruned yearly. Since blooms appear on last year's wood, a good time to prune is right after the plant blooms. Cut one-fifth to one-third of the oldest branches off the plant. You want to cut the branches where the blooms appeared in addition to trimming any broken or diseased branches. Pruning helps improve the appearance of the plant and will encourage more blooms by opening up the center of the plant to sunlight. Mock orange is resistant to both pests and diseases. Philadelphus Coulteri - This is a nearly evergreen kind from N. Mexico and distinct in its waxy flowers with a rosy-purple flush at the base of each petal, forming an inner zone of color. It is somewhat tender, and does not flower freely. 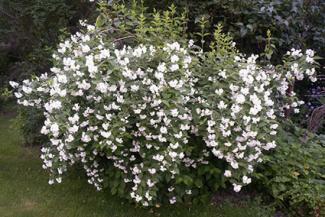 Philadelphus Falconeri - The Falconeri is a graceful plant, 16 feet high, of uncertain origin, but probably from Japan. Its pure white fragrant flowers, of waxen texture, and with sharply-pointed petals, are borne freely in June upon wand-like arching stems that droop gracefully under the heavy clusters. Philadelphus Gordonianus - This variety is from N. America, where it is common near the Columbia River. It grows 10 to 15 feet, is of graceful habit, with a profusion of large faintly-scented flowers in July. This kind will do well with a little shade, and its great value is its late blooming. Philadelphus Grandiflorus - As a large-flowering plant, it is one of the finest of hardy shrubs, reaching a height of 15 to 20 feet. Its numerous flowers measure two inches or more across, are white, and either scentless or faintly fragrant. There are many forms and slight variations of this plant, differing little in general character, and running one into the other. Philadelphus Hirsutus - Less showy than most kinds, the flowers of the P. hirsutus are small and mostly solitary, but they are scattered so freely that a well-flowered plant of four to five feet is pretty, and its effect distinct from the other kinds. Philadelphus Inodorus - Much like P. laxus, this version is more erect and vigorous, with large scentless flowers, useful for cutting where the odor of other kinds is a problem. It is a plant that forces well, but coming from the southern States, it is a little tender in cold districts. Philadelphus Lemoinei - A hybrid from microphyllus crossed with coronarius-a beautiful shrub, it flowers in the latter half of June with its abundant pure white flowers about 1 1/2 inches across, and with a pleasant fruity fragrance. Of neatly compact habit, it reaches a considerable size at maturity. Its form erectus differs only in its more rigidly erect habit. Philadelphus Lewisii - This version is from the Pacific coast of N. America, and nearest hirsutus in its hair-fringed leaves. The flowers are a little smaller, scentless, opening at the end of June and early in July. Philadelphus Mexicanus - This is a beautiful plant and nearly evergreen, but tender save in the warmest parts of the south-west of England and Ireland, where it occasionally covers warm walls near the sea to a height of 15 feet. The flowers are large and deeply cupped, of waxy texture, and either creamy-white or faintly flushed with rose. Their strong spicy perfume is agreeable, and unlike that of any other kind. Philadelphus Microphyllus - The P. microphyllus is from Colorado, California, and N. Mexico; it is hardy and richly beautiful in warm soil and a place where its wood is well ripened. The flowers are small and solitary, but freely produced towards the end of June, milk-white, and with a fruity fragrance. It is the tiniest of the genus, rarely reaching 3 feet in height, with slender stems and small glossy green leaves the size of Box, and grayish, with hair on the underside. Philadelphus Norma - The flowers, which are borne for some distance along the gracefully arching shoots, are each fully two inches in diameter, and single, except in a few cases where there is a tendency to an increased number of petals. They are of the purest white, with bright yellow anthers. Philadelphus Purpureo-Maculatus - This was given a first-class certificate by the Royal Horticultural Society, which was well deserved, not only for its merit, but also for the possibilities it opened up of quite a new race of these beautiful shrubs, whose blossoms hitherto have been white, or nearly so, whereas those of the newcomer have on each petal a distinct blotch of purple-rose. Mock oranges make wonderful privacy screens or hedges and provide fragrant flowers that smell of citrus in early summer with a minimum of care. In addition, they are drought resistant, pest resistant, and disease resistant making them ideal shrubs for a variety of uses. With a little care, your mock orange shrub will thrive for years to come.